If there’s one thing the houses featured on the American Institute of Architects’ Marin Home Tour teach us, it’s how to work with, not against, nature when crafting dwellings. Each of the five homes on the May 15 tour embraces the landscape in which it is sited to such an extent that the boundaries between structure and nature are often pleasantly obscure. Whether it’s the Sausalito home that gives itself completely to the panoramic sweep of the bay, the crescent-shaped home in Mill Valley designed 50 years ago to follow precisely the contours of a forest ridge, or the newly built house, also in Mill Valley, that tucks itself into a steep hillside and then uses the resulting verticality to stunning effect: All have grabbed the gorgeous Marin scenery and run with it. This home of the earth defines the concept of building in harmony with nature. 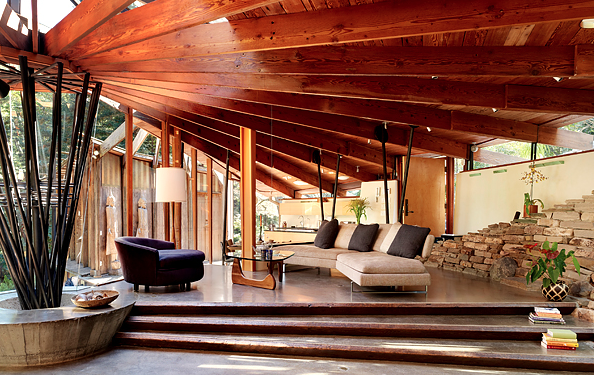 Designed in the early 1960s by Daniel Liebermann, who apprenticed with Frank Lloyd Wright at Taliesin West, the Radius House is just 1,000 square feet, and its unusual crescent shape was chosen to follow, and nestle snugly into, the contours of the forest’s ridge. You can read the article and see more photos here.